Going from soda to water was a smart move by SodaStream International, but it may not be enough to make the business viable again. Image: SodaStream International. The upheaval in the soda market created an identity crisis in at-home beverage maker SodaStream International (NASDAQ:SODA), which has gone from being the leading DIY soda maker to a rechristened "health and wellness" company focused on sparkling water. That doesn't make the prospects for success any better at the beverage maker, as selling a relatively pricey machine for making a commoditized product like water is a tough sell. Yet the potential for a turnaround in the business remains, and though there are no guarantees SodaStream's stock will rise from here, I think there are still some factors that could push it higher over the next few years. When SodaStream first launched in the U.S., being everywhere was a key consideration in driving a critical mass in consumer mindshare. Getting people to adopt a new way of consuming soda necessitated making it available to everyone. You found it at mass retailers like Wal-Mart, department stores such as Macy's, and in specialty outlets like Bed Bath & Beyond. But in stressing quality over quantity, the beverage maker changed its outlook and has pared back its retail presence, going from around 16,900 locations to around 13,000, a near 25% reduction. Yet as management maintains, "There is not one door where we want to be and we're not." Importantly, when it launches its next generation machine later this year, investors will see it gain new retail locations, but they'll be better positioned to handle the logistics of what it takes to sell a SodaStream appliance, whether it's stocking units, keeping flavors in inventory, or handling the CO2 canister exchange program. You'll also find its products in higher performing and higher-end specialty retail shops including specialty grocery and health and wellness retailers, and quite possibly convenience stores, drugstores, and maybe even your local gas station, too, if they can handle it. Of course, key to SodaStream's transformation are the new devices that will come to market, including the Ultimate, which provides filtered, purified, hot, and cold water on-demand that will be introduced in the third quarter; and then there's also SodaStream's Mix, which gives you water, juices, and adult beverages and is expected to come to market early in 2016. Both devices have an Internet of Things interface that allows you to connect to the machine via the cloud through apps. While I admit to being a bit underwhelmed about the promise of a water-centric company being able to offer investors enough growth in a saturated market, I'm equally intrigued by the potential of an adult beverage appliance. 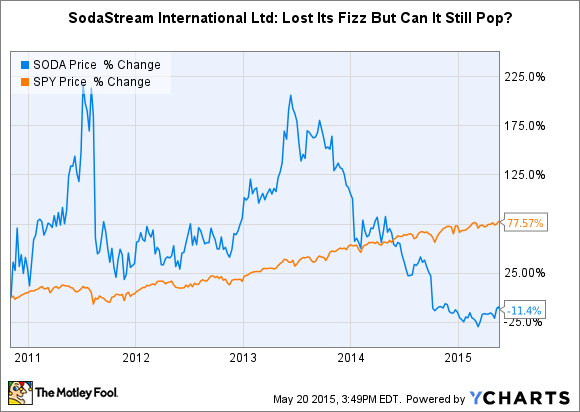 SodaStream International's new adult beverage machine could be just the device to give some pop to its stock, though investors may have to wait until next year to enjoy it. Image: SodaStream International. There could be just enough gee-whiz excitement to find a large enough market, assuming they price it right. Pricing is among the reasons why Keurig Green Mountain (UNKNOWN:GMCR.DL) will fail in challenging SodaStream in the countertop home appliance market (though a primary concentration in the declining soda market won't help either). Keurig just unveiled its own new at-home cold beverage system called the Keurig Kold. While SodaStream investors may have worried the device would eviscerate their company's market share, the coffee company has apparently bungled the opportunity it was offered by pricing its new system at $300, effectively limiting the consumers who can afford to buy it. That means it's essential Soda Stream doesn't make the same mistake with its own new product launches. While the SodaStream Ultimate will likely carry a premium because of its varied uses, ensuring it doesn't cut its knees out from under it by pricing itself out of the market can give the beverage maker a renewed sense of purpose and opportunity. SodaStream International has been given a second lease on life, a rare opportunity for a business. It was smart to realize early enough that soda could only be a tangential part of its overall story, and though water itself is a highly competitive market, there remain enough avenues to exploit that. If the company plays its cards right, sparkling water and adult beverages could give it a new chance to grow. There remains uncertainty about the future, and investors are right to be cautious with a SodaStream International investment, but it looks like the company is at least trying to position itself for future success.